Here we are, day number two for our 30Days30Characters. Full weeks will have a theme, like next week is Superheroes. For these first few days, though, I am talking about miscellaneous characters- just a few of my very favorite characters. Yesterday was Superman, and it was fun to put it together. Make sure you are following me on social media to be alerted when each new post goes up on the site. You won’t want to miss a single day. Feel free to join in the action on social media as well. Who would be your 30 Characters? Make sure to use the hashtag #30Days30Characters, and feel free to tag me as well- @thegeekymormon. 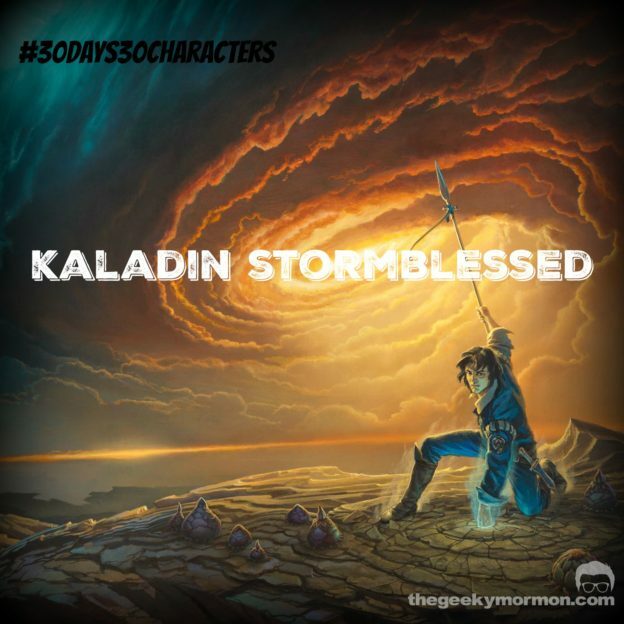 The main protagonist in Brandon Sanderson’s Stormlight Archives series is Kaladin Stormblessed. He is a dark-eyed slave at the beginning of the first book, and comes with an interesting past as a former soldier. He has a strong sense of justice and right and wrong, but has begun to lose faith in the rest of humanity as a whole. Being sold into slavery will do that to you. He can also do what is called surge binding, which is a magical art in this world that has been lost over time. He is a reluctant hero, and it takes him some time before he starts trusting people again. Brandon Sanderson is known in Fantasy reading circles as a master world builder. And rightfully so. His worlds are intricate and detailed and wonderful. Full of cultures and people who are diverse and amazing. I love that about his stories. What really drives his stories and his writing, though, are his characters. They are so real and feel so genuine. Kaladin is no exception. As I mentioned before, he is a reluctant hero. At the beginning, he is ready to give into his fate as a slave, but somehow he finds the way to make the most of it. He ends up on a bridge crew, which is a group of slaves that moves a giant bridge into battle for this army. They have short life expectancies, since they usually die quickly from the enemy arrows. He organizes his crew, finds a way to protect them and makes them a model of efficiency- yet he doesn’t take any credit for it or recognize what he has done. At his core, he cares about people. He cares about fairness. He is what we should all strive to be in many ways, but he’s not perfect. Like any good character, he has his faults. He is the reason you should pick up The Way of Kings and read it. 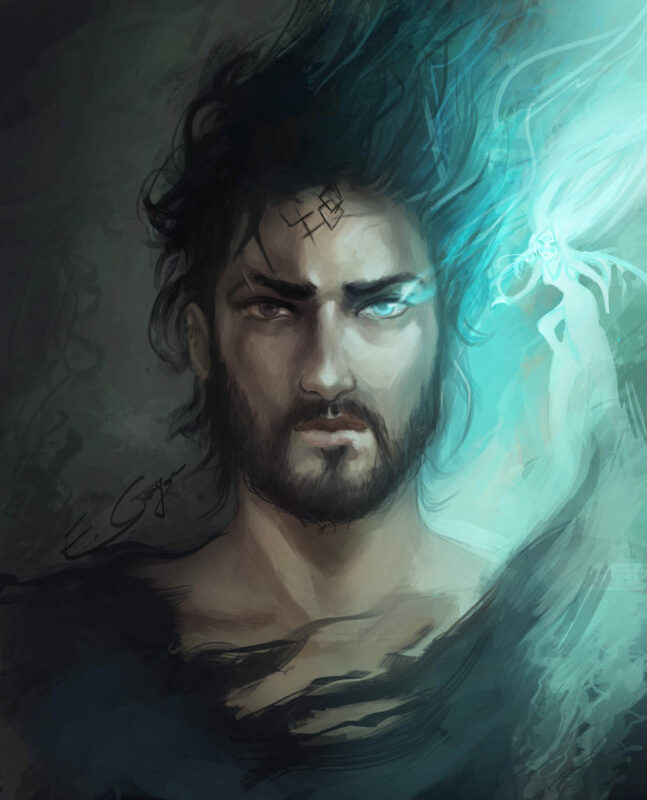 I can’t wait to see him again in Oathbringer, which comes out later this month. I am obsessed with these books right now. They’re so good. Missed day one? You can check it out here. This entry was posted in Random Ramblings and tagged 30Days30Characters, Stormlight Archives on November 2, 2017 by Jake Dietz.